With the Holiday season approaching, many of us will be attending gatherings with our family and friends. These gatherings will undoubtedly include lots of food and lots of cookies. If we’re not careful those calories can add up quickly and we’ll be heading into 2019 weighing a few more pounds than we’d like. But if you follow these five simple tips, you can fight off that extra Holiday weight and be at a much better starting point for your New Year’s resolution. Drink Water, Especially Right Before Meals – You’ve heard it said before that drinking water can help weight loss, and it’s the truth. Drinking water can increase your metabolism up to 30% over a period of 60-90 minutes, helping you burn some extra calories. Drinking water before your meal can also help you eat less, by making you feel “full” sooner. Try Intermittent Fasting – A recent trend in weight loss is intermittent fasting, in which dieters go without eating for 16 consecutive hours out of the day. Most people do this by skipping breakfast, eating all of your food for the day in an eight-hour period during the afternoon and evening and then not eating again until lunch the next day. In addition to reducing caloric intake, intermittent fasting can also boost your metabolism by up to 14%. Cut Back on Added Sugar – As many of us know, too much sugar can be a strong factor in obesity, as well as diabetes and heart disease. A good way to lose weight without changing too much else in your daily routine is to cut back on sugar, so be sure to check labels on what you’re consuming because even so called “health foods” can be loaded with sugar. Eat Less Refined Carbs – Sugars or grains that have been modified to remove fibrous and nutritious aspects of their structure are called refined carbs. Examples of refined carbs are pasta and white bread. Refined carbs can cause blood sugar levels to spike rapidly, leading to hunger. So if you’re going to eat carbs, make sure you eat them in their natural fiber state. Exercise Portion Control or Count Calories – Tracking your caloric intake in a food diary, whether that be on paper on in a mobile app, can be extremely helpful in keeping you on track. Additionally, eating a portion and then taking a break can help you eat less, as you allow your body time to decide whether it’s full. These are just a few tips to help you get started on losing weight this Holiday season but they’re not exclusive. Weight loss can be a complicated process, especially for those who have never attempted it before. 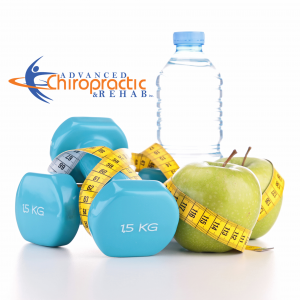 So, if you’re looking for ways to lose weight and would like nutritional and lifestyle advice to get you started, or if you’re looking for a detailed weight loss plan, give Advanced Chiropractic & Rehab Inc. a call today at (330) 726-7404 to schedule a free consultation to see how we can help. We have been servicing the Youngstown and Mahoning Valley area since 2001 with convenient locations in Boardman, Hubbard, and Kinsman. At Advanced Chiropractic & Rehab Inc, we are a multi-disciplinary rehabilitation group that treats work comp injuries, whiplash, sports injuries and specializes in much more than just low back pain.